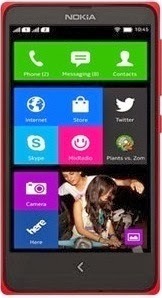 Nokia X is a latest Android device till now, which is launched by Nokia. It has some good specifications and some bad specifications. The development of Nokia X is not that much high which we expected, but still it is awesome. The good news is that, the device has been rooted and has been flashed with the Stock ROM, GApps and other things. Today, I am going to show you how to root your Nokia X and not how to flash stock rom in Nokia X or anything like that. You can flash Google Applications, CyanogenMod ROM, MiUi and other MODs, ROMs from ClockWorkMod Recovery, but to install ClockWorkMod Recovery in your Nokia X, you must root your Android device! Rooting Nokia X is very easy because it has SnapDragon, which can be easily rooted by Framaroot application. You don't need to worry about any kind of brick. Just some seconds and you are rooted. Cool, isn't it? Nokia X has a 4 inch IPS LCD Capacitive touchscreen with 480 x 800 pixels and 233 ppi pixels density. The display of this device has nothing special. The internal memory of Nokia X is 4 GB which is very common in the devices these days, and has 512 MB RAM in it. Ah, gaming phone? NO. It has been flashed with Android 4.1.2. The device has Dual-core 1 GHz Cortex-A5 CPU with Qualcomm MSM8225 Snapdragon S4 Play chipset, which is the good part of this device. For graphics and gaming, this device is stuffed with Adreno 203, which won't give you the playback which you actually needs. Also, the gaming performance will be low in this device. It has a 3.15 Mega Pixels camera which captures nice pictures and records video @30 FPS on 480p. I will not talk about the specifications much, because I am anxious to show you How To Root Nokia X without PC! Let's move to the requirements and all. Don't download anything else which is not stated here, in this guide. You don't need PC or anything else to root your Nokia X. Don't shut this device off while the process is being done. Make sure your Nokia X is charged up to 70% before you move to rest of the guide. This rooting tutorial may or may not work with Nokia X+ or Nokia XL, but you can try. It won't brick your device. Download the APK from your computer and move to your SD Card via USB or Bluetooth or download it from mobile phone itself. Go to the settings of Nokia X, and select Applications from the main list. Open it and enable Unkown sources. Go to your File Explorer and tap on the application. It will display a waring to install the application or not. Just tap on OK. The application will be installed into your device soon. Close everything (just swipe left or right in the Recent application panel). Open the appliaction from your application drawer [It's name will be Framaroot]. Select Superuser and from the drop down list, select SuperSU or if the SuperSU is already select then follow the next step. Click on Gandalf exploit to root your Nokia X.
Reboot your Nokia X to take the effects. Your Nokia X is rooted now! You can confirm it by using any application which requires root or by Root Checker application. You can download the application from Google or Nokia Store. If you have any doubts, then please clear them here! I am there to help you. Here's the source from which we got to know about the rooting tutorial of Nokia X: HERE. You can see my YouTube video on rooting Nokia X, X+ and XL! This video is simple and can be viewed on 720p without lagging!